DETACHED HOME IN THE PERFECT LOCATION AT OCEAN EDGE RESORT! 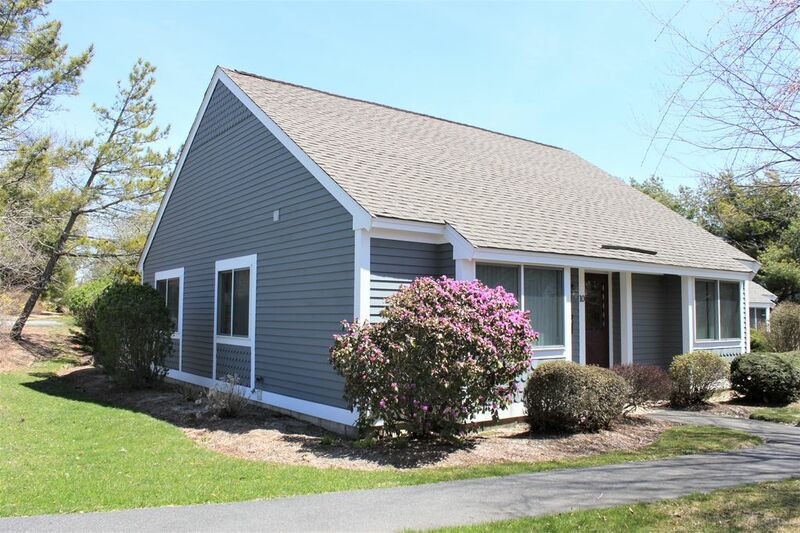 Stand alone home located in the Gray/Susanna Villages of Ocean Edge Resort in Brewster, this unit offers unrivaled convenience, the comfort of A/C, and backyard privacy for up to six guests! The modern kitchen has recently been professionally painted with added new hardware. You have access to a complete inventory of kitchenware, plus toaster, coffee maker, lobster pot, blender, dishwasher, and microwave. For early risers, there is a table for two where you can sip your morning coffee and plan your day. The open design is enhanced by space saving arrangements such as washer and dryer recessed behind closet doors, a pass through from kitchen to dining table that easily accommodates 6 people, and a queen sleeper sofa. The dining area flows into the living room where seating is comfortably arranged to enjoy a flat screen TV with extended cable service through Comcast, dvd and cd player, or stereo. The main bedroom has a queen bed and ensuite bath with walk-in shower. The second bedroom has two twins with an adjacent full bath recently painted (bath/shower combo). Both sleeping quarters boast new bedding! French doors lead to your large patio exquisitely landscaped and equipped with a charcoal grill, and outdoor table with umbrella and chairs where you enjoy drinks or meals in the open air. This home is just 1 mile to the beach! This thoughtfully put together home is convenient to Fletcher pools, the cardio room, tennis, and all the Cape has to offer, and is the absolute perfect destination for your Cape Cod trip! Also included: WiFi, Washer and Dryer, Central Air, and parking for two cars. Guests of this home will have Ocean Edge privileges except access to the private beach area. The resort charges fees to use these amenities, which will include the use of Fletcher indoor & outdoor pools, Fletcher cardio room, Arbor outdoor pool, and the tennis courts. This home does not include Golf privileges.You must complete your OE guest list and submit it to our office 10 days prior to your stay in order to have privileges. Remember all Ocean Edge fees are due upon arrival, paid to Ocean Edge directly by Guests if Pool & Tennis are desired. 6 guests maximum allowed at any time. No parties exceeding the occupancy limit allowed. Travel Insurance is highly recommended, and affordable coverage to protect your vacation investment. CapeCodRentals .Com Our agency works exclusively with rentals, so we devote all of our resources and attention to helping guests find exactly the right home. We strongly believe in using new technology to be able to provide old-fashioned, hands-on service to both our vacationers and our homeowners. Our staff of tenured specialists are long term residents of Cape Cod and can find you the perfect rental AND recommend nearby restaurants, beaches, must-see destinations, and fun things to do in the area. We offer 24/7 Emergency and after-hours service as well as inclusive cleaning service using natural products. We love what we do and are wholly committed to enriching the rental experience for all! We have stayed many times at this beautiful home at Ocean Edge and have always had an enjoyable vacation. The home is in a great location, was very clean and was well maintained and furnished. It also has a beautiful (recently renovated) kitchen. We will definitely stay here again in 2019. Family fun.... biking.... hiking.... sun and surf.. ideal location. Provincetown and Hyannis short drives away. had everything a family could need. Great location, close to the Rail Trail and Route 6A. Well maintained and furnished property. The house is in a nice quiet neighborhood. It was totally clean on our arrival. The beds were comfortable. The outside grounds were very nice including the back patio. Looking forward to our next stay.